14Kt Gold Galloping Horse pendant. 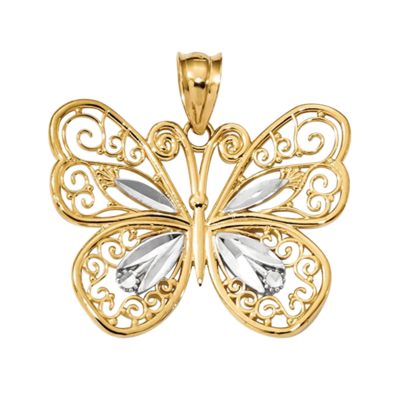 This spirited pendant measures 30mm in length by 31mm wide. He weighs an amazing 7.02grams. 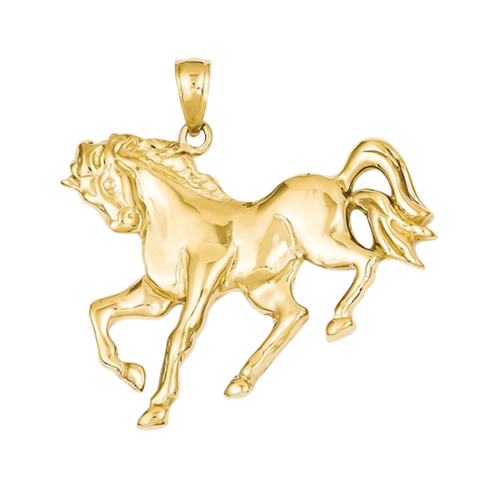 Very detailed horse pendant is solid with an open back. 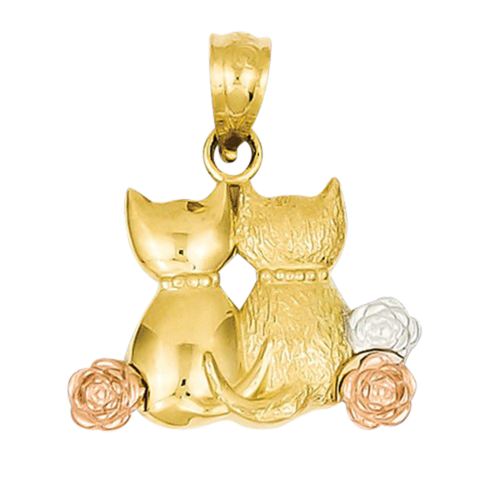 14kt Rose gold Sitting Cats pendant. One kitty is polished the other textured for a lovely combination. They measure 20mm in length by 12mm wide. Pendant has an open back. 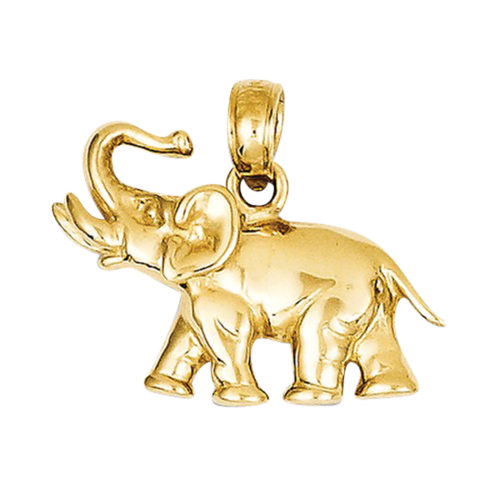 14k Yellow gold Diamond Cut Elephant pendant. 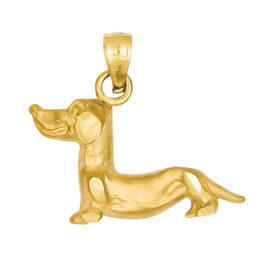 This delightful pendant measures 21mm wide by 19mm in length. He is solid with an open back. Features a satin finish with diamond cut accents. 14kt Gold Pig Pendant. 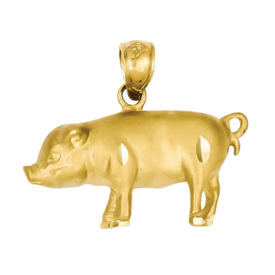 Cute piggee measures 24.5mm wide by 21.5mm top to bottom. He is solid with an open textured back. Diamond cut and a satin finish gives him a little extra style. Regal Giraffee pendant. 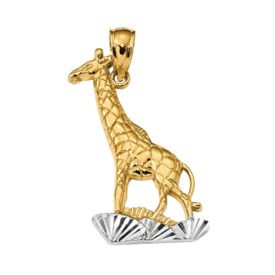 14k Gold and Rhodium diamond cut polished Giraffee pendant. Beautiful Giraffee measures 30.5mm in length by 15mm wide. Diamond cut gives this pendant a little flash, back of this pendant is open. 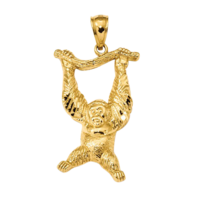 14k Gold Polished Monkey on a Branch pendant. 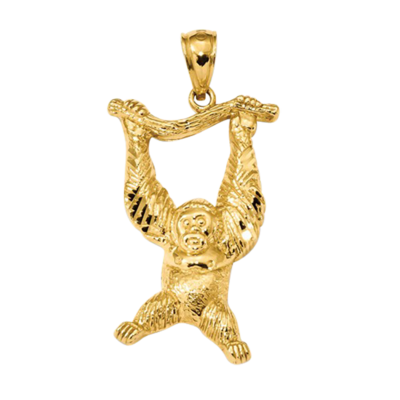 Monkey is diamond-cut and textured polish and he measures 33.5mm in length by 17mm wide. He's Fun for anytime wear. Adorable 14k gold interlocking Giraffes pendant. This dainty pendant is so cute. Meaures 23mm in length by 10mm wide. Loving little pendant. 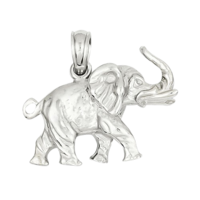 14k White gold 3-D Elephant pendant. Elephant is a side profile with tusks and 3-D design. He features a polished finish and measures 17mm in length by 18mm wide. 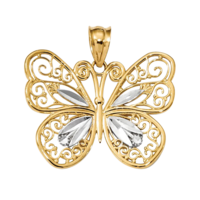 Fancy 14k gold with white rhodium polished filigree Butterfly pendant. Pendant measures 23mm in length by 24.3mm wide before the bail. 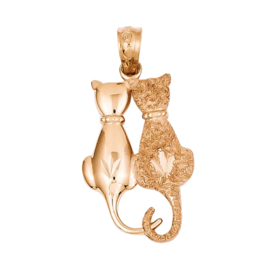 Adorable 14k two tone and Rhodium Kitty friends pendant. This pendant measures 19mm in length by 15mm across. A delightful dainty design you're sure to love. 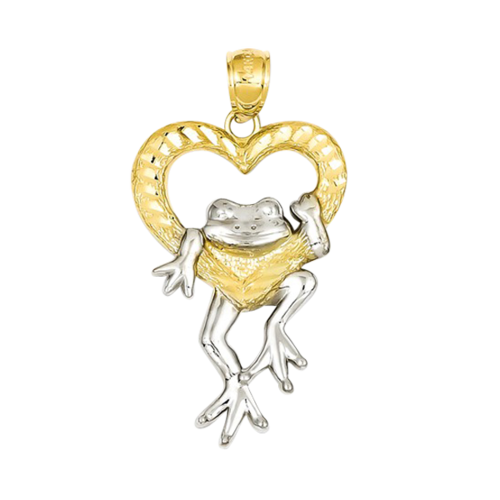 14k Gold and Rhodium diamond cut frog and heart pendant. 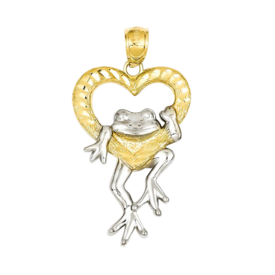 Cute little frog is hanging from a yellow gold heart. This pendant measures 32mm in length by 18mm wide before the bail. A sweet charm pendant with diamond cut design on the heart. 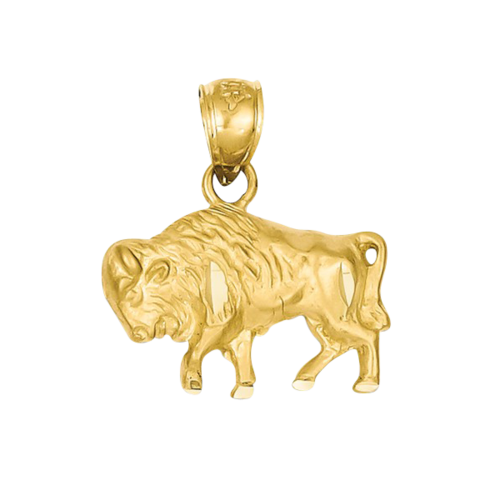 14k Gold diamond cut Buffalo pendant. Pendant measures 19mm in length by 17mm wide before the bail. A detailed charm, open back and features a satin and diamond cut finish. 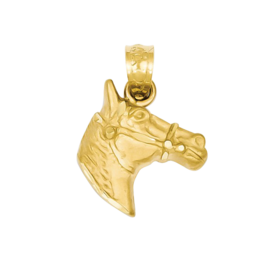 14k Gold diamond cut Horse head pendant. Pendant measures 17mm in length by 13mm wide before the bail. A small detailed charm, open back and features a satin finish. 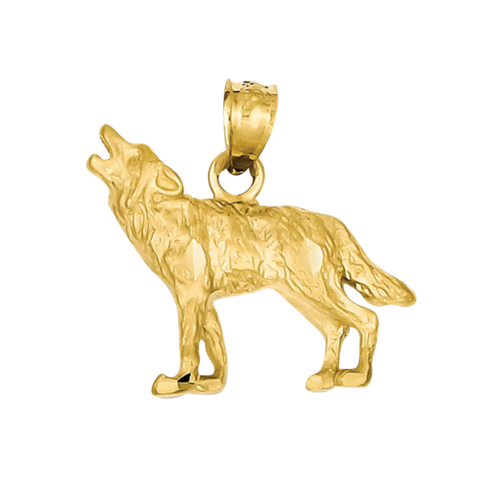 14k Gold diamond cut Wolf pendant. Pendant measures 18mm in length by 18mm wide before the bail. Wolf features a satin finish and has an open back design. 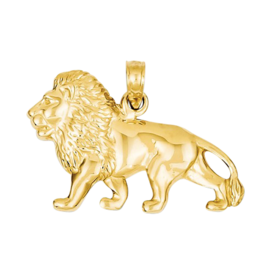 14k Gold Lion charm pendant. This pendant measures 15mm top to bottom before the bail by 23mm wide. Lion has an open back. A cute charm with an open back. 14k Gold polished Elephant charm pendant. This pendant measures 13mm top to bottom before the bail by 17mm wide. 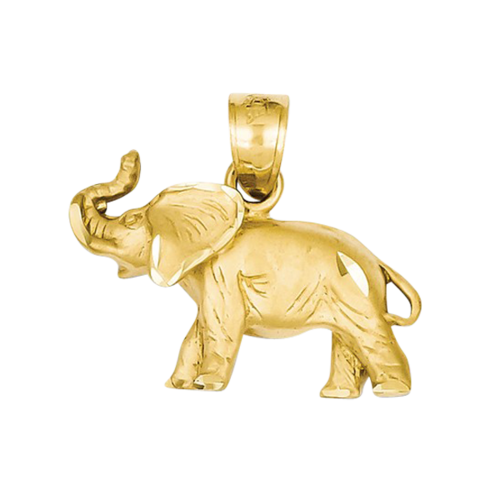 A cute charm with an open back. 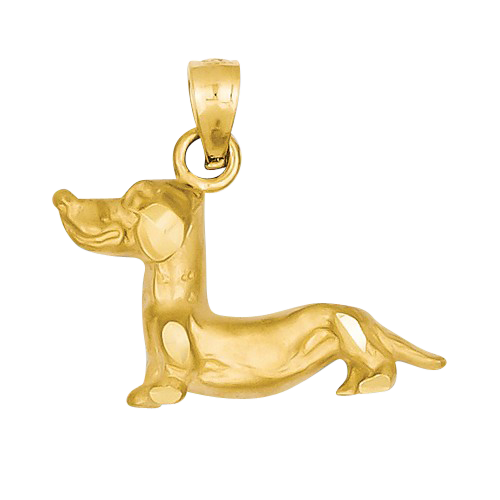 14k Gold diamond-cut Dachshund pendant. This little guy measures 19mm top to bottom by 20mm long. He features a satin finish and has an open back. 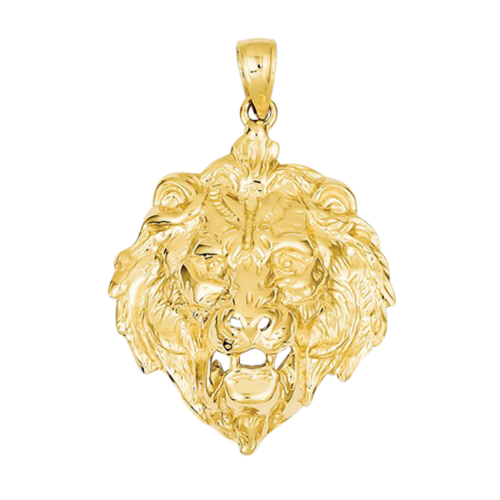 14k Gold Lion's Head pendant. This fierce pendant meaures 30mm in length top to bottom by 24mm across. He weighs 6.86grams is very detailed with an open textured back and polished front. Bold and Proud, this King of the Savannah will look great around your neck. 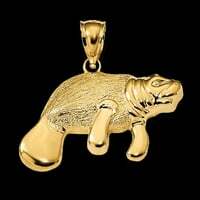 Adorable 14k Yellow gold Manatee pendant. This little Manatee features a detailed satin and polish finish. Measures 24mm wide by 15mm top to bottom before the bail. Pendant has an open back. 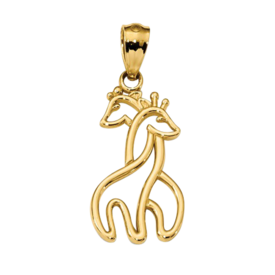 Magical 14k Gold running Zebra pendant. This amazing creature captured in gold measures 20mm in length by 27mm wide. He is casted and features a polished finish with an open back. Beautiful detailing on this Zebra charm.